The Ultimate Joe Dolan Show! Ronan Collins is well-known as an Irish radio and television presenter. 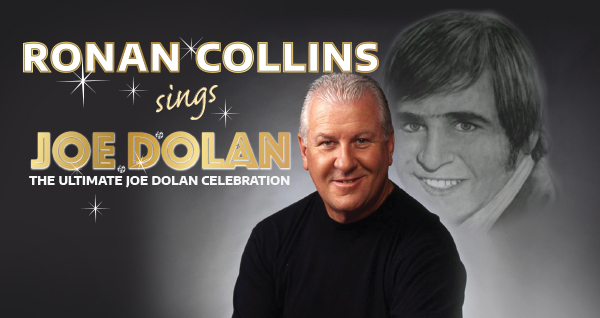 His primetime radio show on RTÉ Radio 1 ‘The Ronan Collins Show’ has been running for many years and many people may not know that he is also one of the very few who can emulate the unique vocal range and match the falsetto quality of Joe Dolan’s voice. The RTE DJ is one of the best singers of showband and pop hits and his nostalgia tour ‘Reeling in The Showband Years’ sells out here at UCH every year, his successful showband hits CD has sales in excess of 20,000! Since the death of Joe Dolan in December 2007 there have been a number of attempts to pay tribute to the great vocal talent of the Westmeath Bachelor but none have been able to replicate the quality of Joe’s voice. So join Ronan for a night of high nostalgia singing all the classic Joe Dolan hits with his showband The Sugarcubes, for a night not to be missed! © 2019 Pat Egan Management.